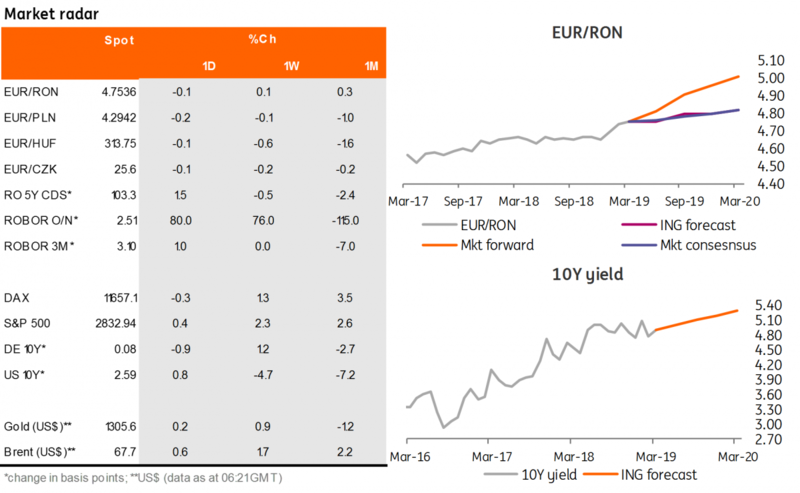 A stable outlook from S&P translated into a stable EUR/RON. The pair continues to trade within the 4.7500-4.7600 range, unimpressed by either the higher carry or the S&P review. We expect more of the same today. A very good 10-year auction was the highlight of yesterday’s session, as the Ministry of Finance sold RON274 million (vs 200 million targeted) at 4.76% average and 4.78% maximum yields, a bit below our 4.80% call. Otherwise, the yields inched another 5-7 basis points lower. The Finance Minister announced that the bank tax decree will likely be modified next week. The National Bank of Romania drained RON6.13 billion from 22 banks in its one week deposit auction. The funding rates adjusted accordingly, trading around the 2.50% key rate for most of the day. It is likely that banks retained some liquidity buffers and didn’t place everything with the central bank and so we expect the cash rates to inch lower again. The longer tenors saw some paying interest after the National Bank of Romania signalled that it's not overly comfortable with front end rates at the deposit facility.